For the second time this season, the Superclasico ended in stalemate as 10-man Boca Juniors and River Plate drew 0-0 at La Bombonera. Last month's meeting at Estadio Monumental had also been a tense and edgy affair, but the home side may be happier with the point on this occasion after playing almost 80 minutes a man light. Midfielder Pablo Perez was the man to depart the action early - his 12th-minute red card the fastest of the league season so far. 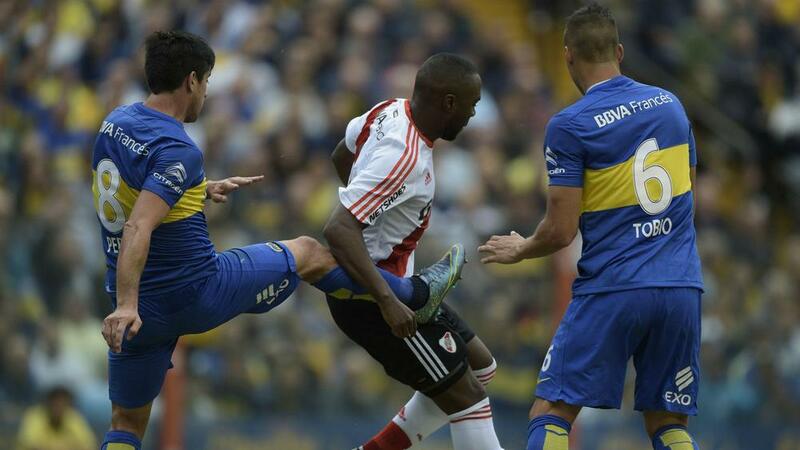 His dismissal came following a late challenge from River's Eder Balanta, who clattered into Boca goalkeeper Agustin Orion. Perez reacted angrily and aimed a violent kick into the stomach of Balanta, leaving referee Dario Herrera little option but to brandish the red card, while Balanta picked up a caution for his troubles. Despite their numerical disadvantage, Boca continued to pose an attacking threat although neither side was able to carve out any clear-cut goalscoring opportunities. River went closest in the first half as Orion flew to his left to keep out Andres D'Alessandro's curling free-kick five minutes prior to the interval. In the second period, Carlos Tevez brought a near-post save out of Marcelo Barovero with seven minutes remaining, but there was to be no derby hero as both sides were left to settle for a point that does little to aid their respective mid-table positions.